What does it mean for the artist to be present? In the history of the visual arts, the artist is generally not present during the exhibition of their work. In the history of the performing arts, the artist is also not present unless they are performing their own work. What does it mean then for artists to insert themselves into their work in order to be present? It means that the artist is no longer just a producer of their work, they are intertwined with it, the viewer experiences the work as inseparable from the artist. Why is this a transformative aspect of art, for the artist to be present, and for the artist to be embedded in the work? Because we are witnessing the work’s creation, we are participating in its becoming, and because of that, the work no longer exists outside of the artist in the past or a hypothetical future, the work exists now. The work is live, the work takes place in time, it becomes a product of time as the artist engages that essential element in the creation and presentation of their work. Time is the material of presence. 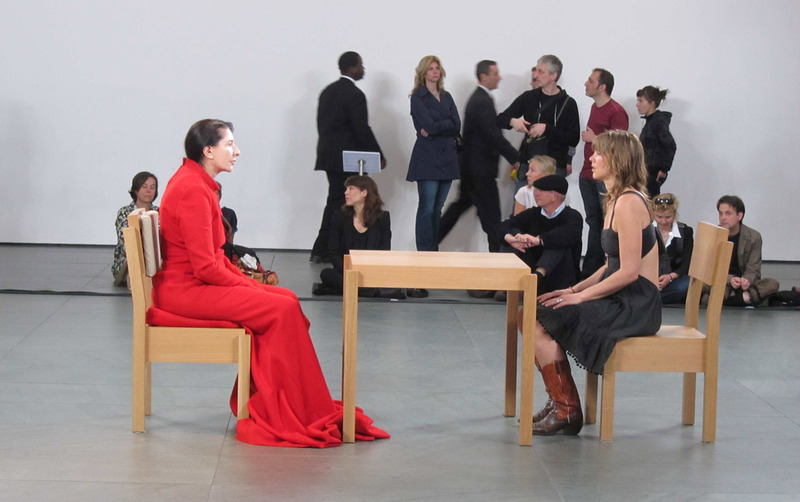 In Marina Abramovic’s The Artist is Present, performed in 2009 at the Museum of Modern Art in New York, the artist undergoes a performance of sheer force and endurance. She is seated at a table, everyday, 8 hours a day, for three months, while viewers are invited to sit across from her for any duration. She simply stares, she simply returns the gaze of the viewer, without expression, without emotion, without gesture. It takes sheer brute energy to do this. Why? Because in The Artist is Present, the work is stripped down to an essential idea, that at the core of her work, you are left with only the living presence of the artist. Like Cage’s 4 33″, in which a musical work is stripped down only to the ambient space a sound must occupy, here, we have only the artist occupying the space in time. Nothing more. Nothing less: revealing the sheer intensity and energy inherent in presence.